During Kate Winslet’s “Titanic 3-D Publicity Tour of Real Talk,” the erstwhile Rose DeWitt Bukater took a break from fat-shaming Leo to snark on Celine, admitting that the immortal Titanic theme song “My Heart Will Go On” makes her “feel like throwing up.” Vulture obviously disagrees, but you know who else is on Team “My Heart” with us? 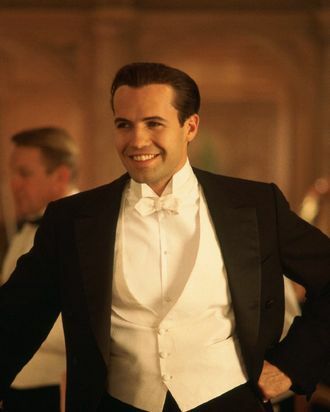 Winslet’s Titanic costar Billy Zane! “It’s not annoying, it’s endearing,” Zane told the Daily Beast. In fact, when the song is played in his presence, Zane is not afraid to go all-in: “I was in Harrods last week and they have live performances there, and there was a singer who performed ‘My Heart Will Go On.’ There were a few balconies that overlooked this main escalator with mannequins in the latest designs leaning over, and as I was going down, people had a giggle and I was trying to compel one of the mannequins to jump. ‘Jump, Rose!’” Billy Zane, we will never let go.